CHICAGO — Navy Pier is the thing with the giant ferris wheel on it that juts out from Chicago’s lakefront into Lake Michigan. Crammed with places to amuse yourself and your kids, it’s said to be the biggest tourist attraction in the state of Illinois. It also plays host every year to an outdoor art installation of sculptures by international artists in Gateway Park, which stands just land-side of the pier itself. The title of the show (no prizes for originality) is BIGart at Navy Pier. This year, there is a pavement mural by Steed Taylor (what he calls “road tattoos”) and abstract sculptures by Antony Caro, Roy Lichtenstein, Nancy Rubins and Almond Zigmund. 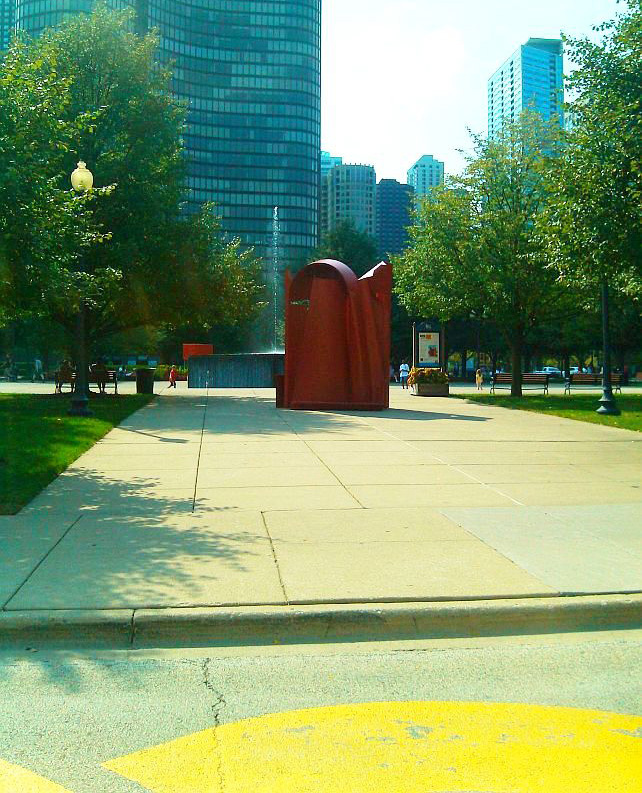 The Rubins sculpture, “Monochrome from Chicago” (2012), is her customary collection of aluminum boats, lashed together like a gigantic, spiky flower. Equally characteristic of their makers are the bright red-painted steel “Blazon” (1987–90) by Antony Caro, and the painted aluminum “Brushstroke” (1987) of Roy Lichtenstein. It’s the last piece that is given prominence, right on the walkway that visitors have to use to cross to the pier itself. The Big Art organizers seem to give equal prominence to the fact that Gagosian is the lender of the sculpture, an act of perhaps necessary obsequiousness that could obscure the real qualities of the sculpture. It’s a witty three-dimensional representation of Lichtenstein’s paintstaking and droll reproductions of impasto brushwork, the bright reflective surface of the aluminum adding a further layer of artificiality and irony to the effect. None of the work is particularly experimental, in that the pieces selected use conventional materials (aluminum and steel, mostly), and they appear designed to fit the spaces in the park in an eye-catching but still tasteful way. The emphasis is on BIG rather than thought-provoking. The Caro sculpture in particular is placed to its disadvantage: surrounded by play areas, and only visible after a few circles of the roadway around the park. On the day that I was there, visitors were clearly eager to get to the hot dogs and ice cream, seeming largely oblivious to the way that Mr. Gagosian had so generously beautified their city space. But that’s ok. The sculptures will be there through October, so there’s plenty of time for people to sit down with their Big Macs and look at the big art. 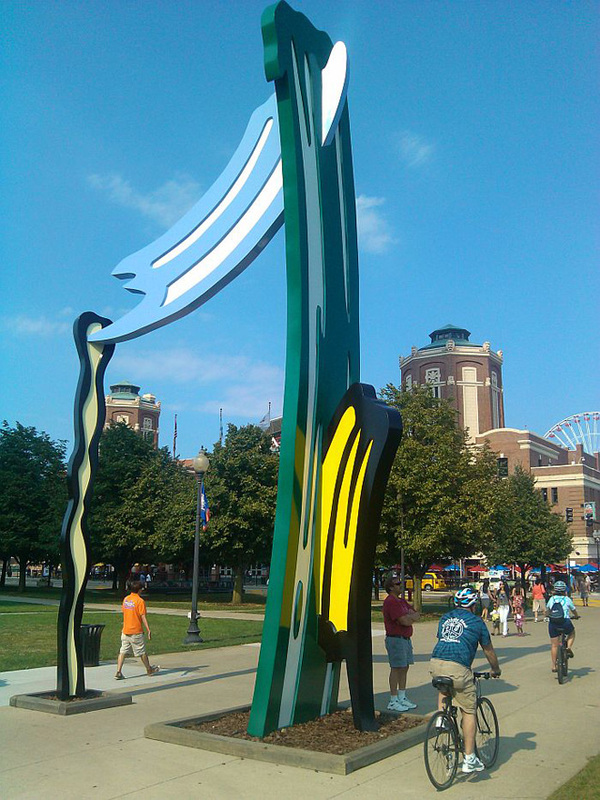 BIGart at Navy Pier continues at the Navy Pier, Chicago until October 2012.